In Windows you would either be using NTFS or FAT32 file system. The maximum length of a file that is supported in NTFS and FAT32 is 255 characters. There may be certain files that may you may be using will be close to 255 characters. So when you plan to do file synchronization or try to burn a CD / DVD then there will be instances that owing to long file name path these programs may throw up error. To find out such files it may hectic and difficult. 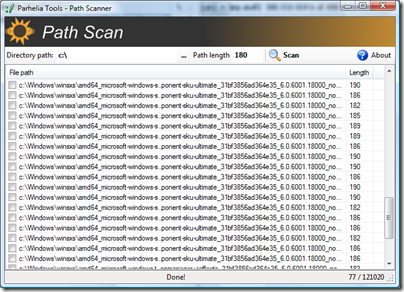 To ease this we there is a free utility called Path Scanner that can scan files and folders with long path names. Open the Path Scanner and point the directory that you intend scan with the number of characters for the path length as search criteria. The Path Scanner will search and list out the files and folders with long path names with the selected search criteria. The list of files and folders that is generated can be exported to CSV file format which you can save for your reference. A pretty neat tool that you can use for this purpose. you can use long path tool to Find Out Files and Folder with Long Path Names in Windows. client requests. Do some research and see if there are any recommendations online. Long Path Tool is awesome. You can also try using Long Path Tool. What’s up,I log on to your new stuff named “Find Out Files and Folder with Long Path Names in Windows” regularly.Your story-telling style is witty, keep up the good work! And you can look our website about اغانى مصرى. sawme interest. If you havve any recommendations, please let me know.